Jacob F. Davis / 5 July 2010 Add to Flipboard Magazine. determinate: having exact and discernible limits or form : the phrase has lost any determinate meaning. determinable: 1 able to be firmly decided or definitely ascertained : a readily determinable market value. A multiplication problem has 2 inputs. If you know those inputs, you know the output. Every single time that 2 and 3 are inputted into a multiplication problem, the process yields a 6. There are no instances of 2 multiplied by 3 that result in anything other than 6. 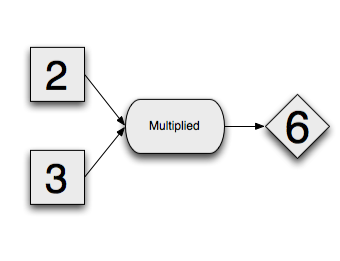 Since you can determine the output given the input, a process like multiplication is determinate. This process is completely determined by the inputs, and the only way you can change the output is by changing the input. It is possible to create complex results using iterated determinate functions. based on or adapted to a theory of probability; subject to or involving chance variation : the main approaches are either rule-based or probabilistic. There are two outcomes, 1) Heads or 2) Tails. Each outcome has a p(success)=0.5 or 50%. So, each time you flip the coin there is no way to determine the outcome. In the long-run (1000 flips, for example) and out to an infinite number of trials, however, each outcome will happen just as often as the other. Important about this process is that it requires no inputs – that means that no matter what you input into the process, it will have absolutely no effect on the result. 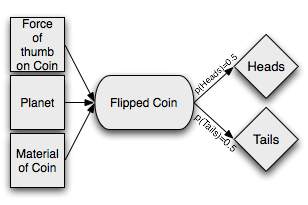 Here is our coin process redrawn with inputs that include the force with which you flip the coin, the planet where the coin is flipped, and the material of the coin. None of these inputs will change the fact that each side of the coin has a 50% chance to be the output. If you cannot give the process inputs (or if the process is independent of the inputs), then you have no control over the outcome. made, done, happening, or chosen without method or conscious decision : a random sample of 100 households. • Statistics governed by or involving equal chances for each item. A special case of a probabilistic function is where the outcome is completely random. 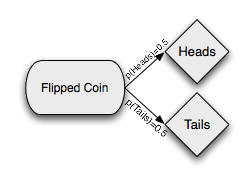 In the case of the flipped coin, the possible outcome of a flip is either heads or tails. On an evenly balanced coin, the p(heads) = p(tails). Another way to say this is that the outcome is uniformly distributed, and that each outcome has an equal chance as the other. Since all outcomes are equal, the outcome is completely random. Lets look at the similarities and differences between determinate and probabilistic processes. The outcome of a purely determinate process is completely determined by it’s inputs, but the outcome of a purely probabilistic process is completely independent of it’s inputs. Some outcomes might be more probable than others, but each time you enter the exact same inputs you might get something different or something previously unthought of. Complex functions might be more deterministic in nature, more probabilistic in nature, or strike an even balance.